Suarez was narrowly pipped to the prize by Rochela last season; this year there was no doubt who would win with the Spaniard winning in a landslide. Suarez was handed a more attacking role alongside Dragan Boskovic most of the season and revelled in it, scoring 18 goals and contributing 13 assists in all competitions. He may have his critics, particularly here at The Sandpit, and it has to be said that those stats could be even better if he was more consistent and less fond of getting into pointless on-pitch squabbles with referees and opponents, but Port would struggle to replace those kinds of numbers if he left. Port’s much-vaunted big winter signing started with a bang (that goal against Pattaya), then went quiet, culminating in the unsavoury scenes of Chainatgate, then went on a run form, then went quiet again, and just as we were about to name him as the disappointment of the season, exploded into life late on, scoring 6 goals in the last 2 games to take his tally to 28 in all competitions. To be fair to the big Montenegrin, Port haven’t exactly played to his strengths and he’s had to go looking for the ball far too often, but his late season form gives us hope that, in 2019, we’ll see the best of Bosko. The winner of our Writers’ POTY Award also got some love – though not as much – from our readers, finishing 3rd overall. As we have said already, you’re not going to get MOTM performances from Niti but you are going to get 110% effort, and virtually zero mistakes, week in and week out, and in a season when Port’s stars alternated stellar performances with no-shows, that counts for a lot. Niti’s improvement since 2016 has been a joy to watch and 2019 should be the season when the rest of T1 sits up & takes notice. And it ended with a bang. And what a bang! Fourteen goals in three games (nearly a fifth of our goals all season); just another one yesterday would have given us a goal tally in those games of 555 – now that would have been a laugh. Port went into this match knowing that a win would secure third place while any other result that matched Muangthong’s would have the same effect. With the match switched from Pattaya to the ever-so-slightly more accessible (in distance anyway) 72nd year anniversary stadium in Minburi, the opportunity for a large, vocal support to spur Port over the line was in place. The Klongtoey Army did not disappoint, the 1000 tickets on sale quickly snapped up with others getting in by virtue of the Pattaya allocation. The scene was set. Port opened brightly with Rochela’s glancing header from a Pakorn free-kick in the 9th minute just evading the far post. Pattaya had the better of the play after that with a clear threat coming from their tall boys, most notably Korean centre back and captain Lee Won-Young, whose head-on from a free kick was scuffed past the post by left-winger Chayawhat. Port were to take the lead, slightly against the run of play, in the 24th minute, Suarez’s (try saying that) left-foot cross from the right wing being perfectly taken on his chest by an unchallenged Boskovic, before hammering a right-foot volley into the top left hand corner of the goal; after reaching the ton last week, the muscular Montenegrin was on a roll. It certainly brought a smile to the face of Madame Pang, sheltering in the dug-out in what looked like a cheap 7-11 rain mac, but then I’m no judge of fashion. The lead was increased on the half-hour with a sumptuous team goal. Pakorn’s long cross-pitch ball from the left was headed into the box by Nurul for Suarez to run onto and, when his prod was deflected by the keeper, Bosko was on the spot like a true poacher to nudge the ball over the line. It may have got there without him but this was a man scenting blood and he was not to be denied. Eleven minutes later the travelling fans were sent into raptures with a third Bosko goal; Suarez once again providing the assist with another left-footed cross from the right, inch-perfectly placed for Bosko to nudge home back across the goal. This was Suarez again in creative midfielder mode – the mint was back. 3-0 at half-time and surely there was no way back for Pattaya. Muangthong were being held 0-0 by Bangkok Utd and third place was in sight. Then the heavens opened. It had been raining with varying severity throughout the first half but the teams had no sooner left the field than the rain swept across the stadium with a biblical vengeance, quickly turning the pitch into a sodden mess, with large puddles soon gathering in both halves. It seemed almost impossible that play would continue; certainly not in the English Premier League but, thankfully, this is Thailand and the rules are, as it turned out, different and viewed with more optimism. However, I was already pessimistically imagining a midweek replay at Pattaya where we just couldn’t replicate our form of the past three games, to surrender our coveted third place spot without a fight. Then news filtered through that the second half was to be delayed by 20 minutes while the groundsmen performed their best Canute-like miracles and, even though there were still significant pools of water at both ends, play thankfully resumed. It was rumoured that Terens might appear in a blue and orange diving suit, complete with snorkel, to lurk in one of the puddles on the edge of the opposition box before rising to the surface to grab his precious first goal, coveted by his adoring fans as much as Terens. Sadly, it was not to be. Pattaya seemed to adapt better to the atrocious conditions, and long balls into the box to their big lads was always going to be a legitimate tactic. Nittipong got away with a potential handball in the box on 50 minutes before Peeradon blasted the resultant clearance over the bar from the edge of the box. Port were living on the edge, giving away free kicks in dangerous areas and, from one of these, Lee Won headed home a curling free kick, virtually unchallenged. Another goal for the Blue Dolphins at this point would have made for a nervy last half hour. Suarez was having a running battle with Korean midfielder Kim Tae-yeon, which provided much peripheral entertainment. 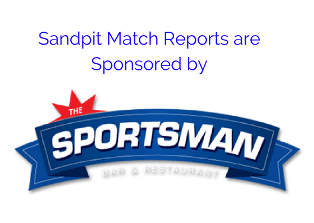 Fortunately, Port weathered the storm and with just four minutes of normal time to go, substitute Arthit, the Port Pele, made a ploughing run through the puddles on the right before crossing to Man of the Match Bosko to sweep the ball home in majestic fashion. The shirt came off, Madame Pang got excited again, whether at the sight of Bosko’s pecs or the amazing scoreline and the Port fans entered a state of delirium. 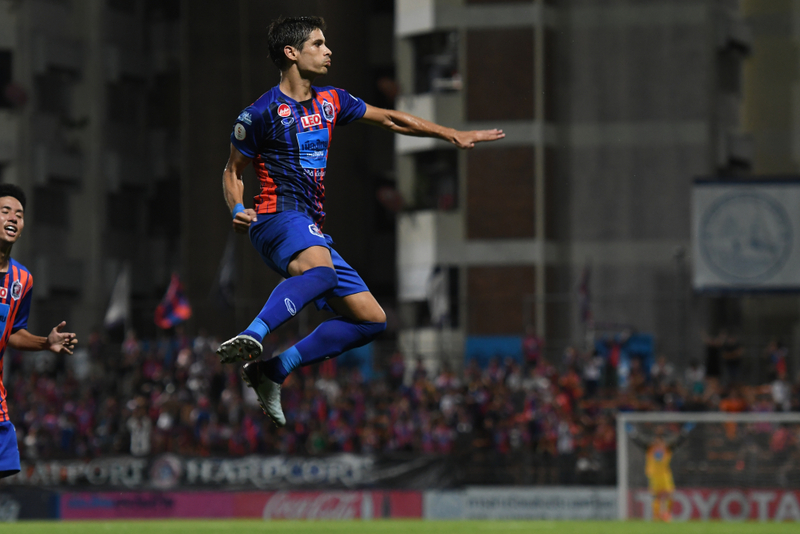 There was still time for Watchara to provide some first class entertainment with at least two spectacular saves and a charge outside the box to twice defy onrushing Pattaya forwards. At times his reflex saves are almost casual, like a man on a sofa reaching for the remote and you think, is he taking the piss? I, for one, hope to see more of him next year. The final whistle heralded in some exuberant celebrations, kicked off by the traditional team slide towards the fans, while shirts, shin-pads and other assorted paraphernalia were hurled into the crowd who were belting out their Khlongtoey anthems with gusto. The mutual respect and affection between players and fans was palpable. And rightly so. There will be other reflections made on this site about the Port season but for now let’s just bathe in the glory of our best finish since 2003, with 73 goals scored, only 3 fewer than Champions Buriram. Now we await the Thai Cup Final on Saturday, October 27th when we will all be Buriram supporters. Finally, a sight for drowned rats: Legoland has fallen. There can be only one. This was the kind of dominant attacking performance we signed Bosko for, and which has been sadly all too rare this season. He was simply unplayable and took his tally to 28 for the season in all competitions – the best return from any Port striker for many a year. Let’s hope he can continue his late season form in 2019. The big Montenegrin striker with a beard you could hide a badger in came with a huge reputation and a price tag to match, and so expectations were sky high – and the Bosk probably exceeded them. 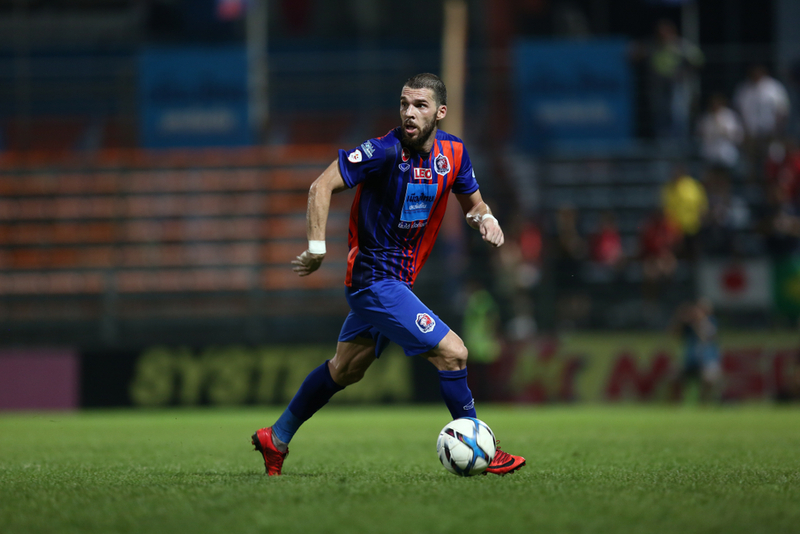 He’s more than just a striker and was frequently found dropping back to midfield or moving out to the wing looking for the ball and creating chances for teammates – his interplay with Nurul in the second half was electrifying. But scoring goals is what Dragan does best and he can’t have scored too many better than his debut effort for Port. In the 44th minute he picked up the ball on the left, ran into the box at high speed, pretended to overrun the ball, bamboozled two Pattaya defenders with some nifty footwork, and then fired an absolute thunderbastard of a shot into the far corner, before celebrating in front of a packed terrace – an unfamiliar experience for him after 3 seasons at Bangkok Utd. The Thailand international also arrived with a hefty price tag, and before the game the talk was of how Jadet could accommodate both 2017’s top assister and Port’s own king of the assists, Pakorn, in the same team. He tried, Nurul starting on the left whilst Pakorn began on the right, but it wasn’t until the second half when the pocket rocket from Chonburi switched to his favoured side that we saw him at his best. With incredible pace, lovely technique and a very low centre of gravity Nurul is a defender’s nightmare, and he gave Pattaya’s defenders a torrid time, winning a host of free kicks and drawing yellow and red cards, as well as creating Port’s second goal (his shot was saved and rebounded to Suarez) and striking up an early understanding with Boskovic. He was my MOTM and looks like one hell of a signing. In years to come, Port fans will be boasting that they were there when the young ex-Port Futsal player made his debut. Given just 15 minutes to make his mark, having replaced Pakorn from the bench, he grabbed the chance with both hands and made himself the main post-match topic of conversation. After crashing a shot against the post with his first touch, he then took on free-kick duties and curled in a sublime Ronaldo-esque effort in the last minute to give Port a 3-0 win and close out the game, before celebrating by doing the funky chicken in front of Zone C. A brief debut, but he crammed more into those 15 minutes than last year’s left-wing substitute Tana has managed in two seasons. The young Thai-Swede only joined on deadline day and so hadn’t had much preparation time with his new teammates, but with only Panpanpong and Jetjinn for competition he went straight into the first team and didn’t disappoint. Like Panpanpong, Kevin likes to get forward and has a cracking cross on him (his 7th minute free kick almost led to a goal for Todsapol); unlike Panpanpong he doesn’t require a motorbike taxi to get him back into position and he fulfilled his defensive responsibilities admirably. It was a solid, unspectacular start for the defender, which is exactly what you want from a left-back, and a rare clean sheet for Port was testimony to the fact that we no longer have a weak link at the back. The inch-high Indonesian had a flash symbol shaved into his head in readiness for today’s game, ready to delight his army of Indonesian (and, increasingly, Thai) fans. Sadly The Flash only got a couple of minutes and didn’t get a touch, though he’d have been away if Boskovic had picked him out late in the game. So it would be unfair to give him a rating, but his proximity to the first team suggests we’ll be seeing a lot of him in 2018. 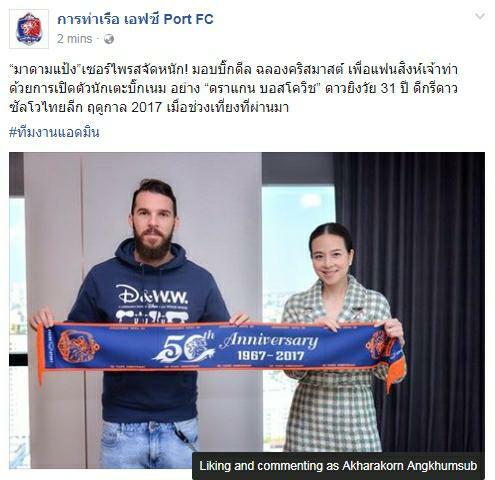 Just when we were getting worried about the lack of a decent striker at Port, the club today announced the signing of 2017 T1 top scorer Dragan Boskovic from Bangkok Utd. Yes, that Dragan Boskovic. The one who scored 38 goals in 33 games last season. The one who has scored 71 times in 95 games for Bangkok Utd. HIM. Mme Pang described the deal as “an early new year present for Port fans” and she’s right about that. As of yet we don’t have all the details of the deal, but frankly, we don’t care. We assume he hasn’t come cheap and we also guess it’s probably a 1-year deal. But whatever the T&Cs, Boskovic is a Port player and we finally have the Scary Foreign Striker we’ve been crying out for for so long. Our mouths are already watering at the prospect of Boskovic teaming up with the likes of Pakorn, Nurul, Bodin and Nebihi in Port’s attack next season. If Port can just tighten up at the back and stop conceding penalties and silly goals, then 2018 looks like being a very, very exciting season indeed.